Amateur boxing will once again take center stage in Campbell at the Palermo Center this Saturday, May 5 as promoter Chuck Haskell presents All-Star Boxing Show 2. 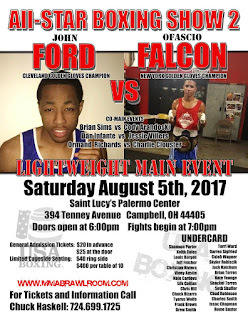 The main event for the evening is an intriguing lightweight showdown which was originally slated to take place in May between a pair of Golden Glove Champions as the winner of the Cleveland Golden Gloves, Ryizeemmeon Ford takes on the Ofacio Falcon who won the New York City Golden Gloves tournament. Ford, 24, hails from Alliance, Ohio and has been staying active in the ring including a victory a week ago at the Ohio State Fair in Columbus. 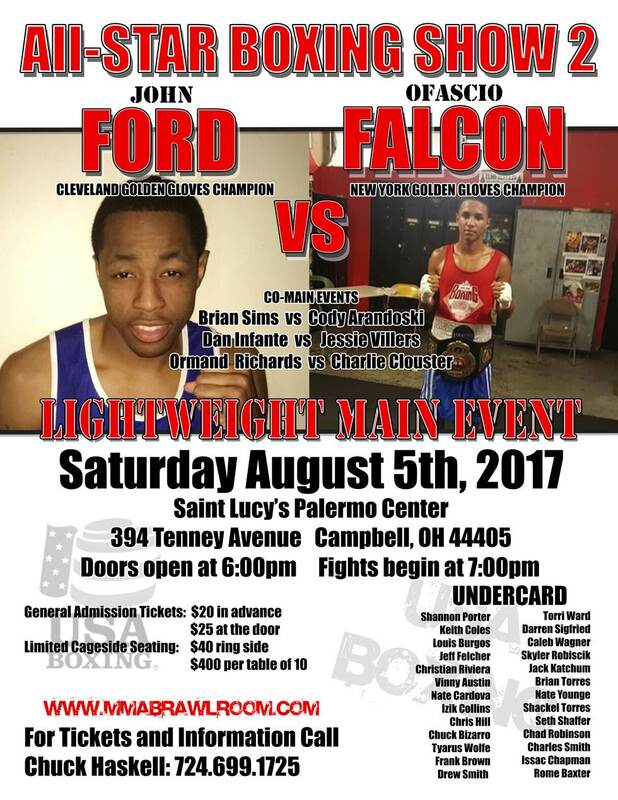 Co-headlining will be Brian Sims of Downtown Boxing Club who will be taking on Cody Orahoske of Cleveland in a 160-pound fight. Sims and Orahoske were supposed to fight back in June as the main event of the "Punching for Paws" outdoor event, however, inclement weather canceled their bout. Youngstown super heavyweight Dan Infante will be in action as well taking on Akron knockout artist Jesse Villers. Villers has been impressive as of late including a first round knockout over William Pee of Louisville, Kentucky back in May at the Battle in the Ballroom 21 in Cleveland. Tickets for the event are $25 at the door for general admission and $40 for ringside seating. First bell is slated for 7:00 pm with the doors opening at 6:00 pm.